Sysmon View: an off-line Sysmon log visualization tool. Sysmon Shell: a Sysmon configuration utility. 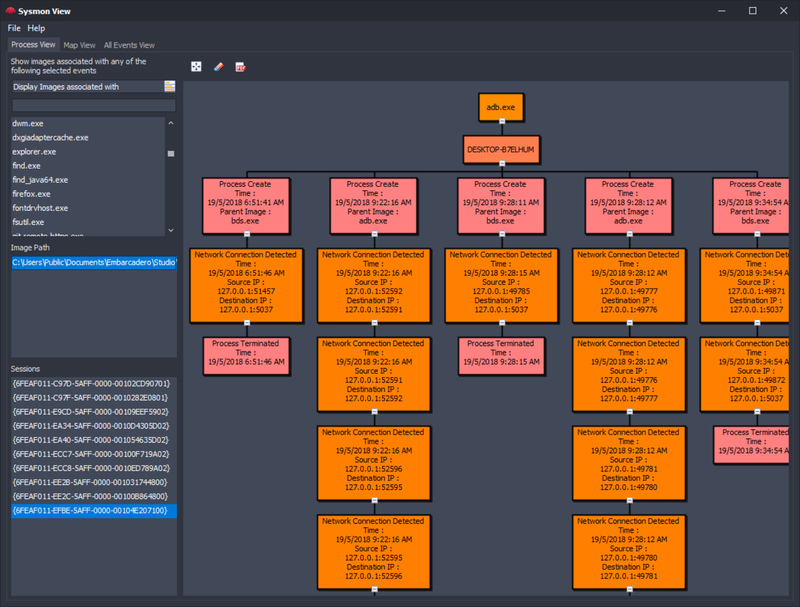 Sysmon View helps in tracking and visualizing Sysmon logs by logically grouping and correlating the various Sysmon events together, using existing events data, such as executables names, session GUIDs, event creation time, etc., the tool then re-arranges this data for display into multiple views. Once exported, run Sysmon View and import the generated file “eventlog.xml” (or the name you selected), please note that this might take some time, depending on the size of the log file (the file needs to be imported once, subsequent runs of Sysmon View do not require importing the data again, just use the file menu File -> Load existing data to load previously imported data again). All data will be imported to an SQLite database file named SysmonViewDB that resides in the same location as Sysmon View executable. This file can be shared with others if required, just place the file in the same location as Sysmon View and use the command File -> Load existing data. Each time a new XML file is imported, the database file will be deleted and re-created. To preserve any previously imported data, copy the database file to another location or simply rename it. The database can be used directly in your own applications too, the database contains summaries of hashes, executables, IP addresses, geo mappings and all are logically linked through a file name or a session (executable GUID). Sysmon View version 1.5 can import Sysmon events from Elasticsearch. To get started, configure Winlogbeat to log Sysmon events to an Elasticsearch instance and create an index for “winlogbeats-*”, then use the new Elasticsearch import command from the “File” menu. Good reference to this setup can be found here. Process View this view simply helps focus on a summary of “run sessions”, for example, the analyst can start with executable name (such as cmd.exe) or event type (such as Network event), from there, further filtering can be applied, for example, finding running sessions originating for the same binary, but from different locations. This view utilizes the process GUID to filter events per session “run”, selecting any running session (from the list of GUIDs) will show all other related (correlated) events in a simple data-flow-like view, sorted using the time of the event. Note: in case data is being imported from an Elasticsearch instance instead of single machine, events can be arranged per executable per machine – check previous section “Experimental – Sysmon View and Elasticsearch”). Access to Sysmon event details is provided by simply double-clicking any event in the view, for example, the previous screen capture shows the details of the Process Creation event (event ID 1), the tool also can integrate with VirusTotal upon demand for further hash and IP lookup (Needs an API key registration). Map View : During the events import process, there is an option to geo-locate IP addresses, if set, Sysmon View will try to geo-map Network Destinations using https://ipstack.com/ service. Copyright 2018 Nader Shalabi. All rights reserved.